A Podiatrist can check if your shoe is the correct fit and type that you need. I have given footwear advice and assessed well over 30 000 patients in my career. That is a lot of pairs of shoes that have been assessed. In the footwear world today there is so much choice. I feel it is a challenge for patients to get a shoe that is the correct fit. Given the average Australian spends 7 hours on their feet at day, its important to get a shoe that fits your foot correctly. This ensures comfort, and protects your feet from further deformity. Podiatrists focus exclusively on footwear and are known experts in the industry. The heel needs to sit comfortably into the back of the heel counter, with the correct depth, height and shape around the ankle bones to avoid irritations. Ensure that the foot sits into the widest part of the shoe, with no forefoot over hang or excess space. Making sure the volume of the shoe matches the fitting requirements, and relevant lacing techniques to improve the comfort and fit of the shoe can be used. Check that the fit within the toe box matches the forefoot shape. The shoe length is determined by the forefoot shape and longest toe. The length is checked when the patient is standing up and their toes are down. Forefoot flexibility in the midsole allowing the foot to flex in a natural position. Inspire Podiatry works closely with experienced physiotherapists Rob Thams and Scott Smith who are the founders of Albany Creek Physiotherapy. They have an established practice which has been open in Albany Creek for over 30 years. As a sports podiatrist I honestly believe that patient results are best achieved when there is a multidisciplinary approach. 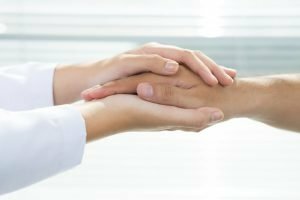 For patient care it’s important to identify when there is a need to cross refer to another allied health practitioner. This way you are getting the best clinical expertise in treating a particular concern or sports injury. Do you wake up and limp on your feet and struggle to walk after rest? The chances are you may be suffering from plantar heel pain or heel spurs or what podiatrists call plantar fasciitis. It’s heel pain on the bottom of the heel that throbs. The heel pain can sometimes sear and cause sharp pains in your heel. How Common is Heel Pain? Heel pain is something we see on a daily basis at Inspire Podiatry at Albany Creek. Heel pain can affect up to 6% of the population. It is a repetitive injury so it can account for 8% of all running injuries (Taunton, 2002). Because if you are carrying a few extra kilograms or standing on your feet a lot at work you can be more prone to developing heel pain. I rarely send a patient for images unless there are other underlying conditions suspected. An X-ray may show a heel spur but this does not treat your foot pain. Believe it or not the presence or absence of a heel spur is not helpful in the diagnosis of plantar heel pain as, 19% of people without plantar fasciitis have heel spurs (DiMarcangelo MT, 1997). Most importantly, treatment for heel pain is best achieved when it is detected early. If you have a low arch height, this can directly increase the amount of strain that is placed on the plantar fascia. The plantar fascial ligament is a long fibrous band of connective tissue that originates from the bottom of the heel and runs along the arch of the foot towards the big toe. This is why shoe inserts or shoe orthotics can directly support the arch because they reduce the strain placed on the plantar fascia. Strapping techniques for heel pain can reduce the strain by 48%. 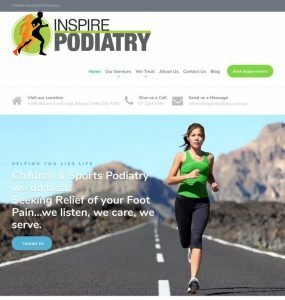 At Inspire Podiatry we often use foot taping on patients at their initial consultation to give them immediate relief with their walking and to restore a normal walking pattern without the limp. The latest evidence in the research is to treat heel pain like similar to an angry tendon. We can show you in your treatment session how to perform high-load strength training to improve your heel pain. Our feet are designed to absorb half the weight of the body on initial heel strike on our heels. Limping and abnormal walking because of pain, can cause an increased stiffness in our ankle. This is why it is really important that we restore the range of movement in the ankle and foot joints to reduce the stiffness, so our feet can absorb shock. Some people can stretch and stretch and still be stiff. At Inspire Podiatry we use mobilisation techniques which are gentle movements that manipulate the joints to improve their congruency (contact points). This inturn assists to release the fascial tissue to improve the range of movement in the feet. We can also use dry needling techniques (a form of acupuncture) to reduce the tight knotting in the calf muscles which can improve ankle range of movement and indirectly reduce the strain on the plantar fascia. Is Cortisone Good for Heel Pain? At our Albany Creek podiatry clinic I often see patients who have had heel pain for months. Research has shown the use of non-steroidal anti-inflammatory drugs or ice are not very helpful. This is because there isn’t a lot of inflammation in the tissue. Degenerative changes in the fascia are noted rather than inflammatory. Sometimes patients ask “should I have a cortisone injection in my heel”? Cortisone should not be the first line of treatment offered for heel pain. Research has found cortisone does not improve the long term outcomes (Crawford.F 2003). An injection of cortisone may cause plantar fascial rupture (Aceredo JI, 1998). Cortisone can assist to reduce pain but pain often reoccurs after 4 weeks (McMillan, 2012). I like to treat the underlying cause of the problem which is often the foot mechanics and alignment of their arch height. Our website is up and we are super excited to provide Podiatry consultations to our customers.